It's actually quite simple though potentially misleading. Remember, a player's defensive rating (DRtg) is a combination of all things defense (forced misses, forced turnovers, free throw makes and misses on fouls committed, field goals allowed as well as defensive rebounds). When looking at Parker's stat line you'll see why the numbers are accurate despite seemingly being misleading: Parker had a team-high eight defensive boards, forced 6.5 missed shots and also helped UNC commit 2.5 turnovers. So yes, while Parker allowed a team-high six made shots there is more that goes into a defensive rating than just allowing baskets. If anything, the defensive score sheet highlights how good Parker was away from the ball in help-side situations and with his active hands in passing lanes. What we seemingly know now is taking Parker one-on-one is an advantage to the offense unless UNC brings a help defender early. 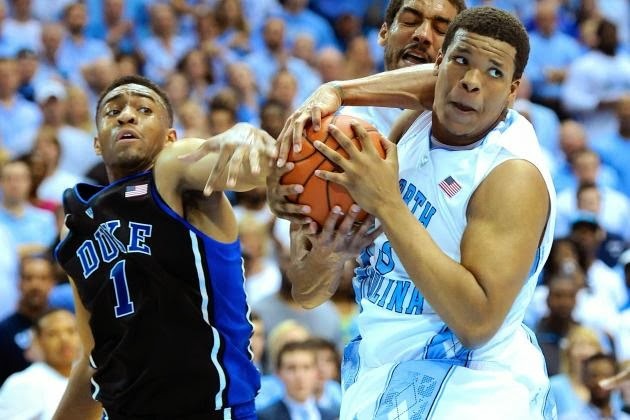 James McAdoo has never looked like a lottery NBA pick to me. Offensively, he doesn't appear strong enough with the ball and his jump shot leaves a lot to be desired. What has impressed me most this season: His defense. 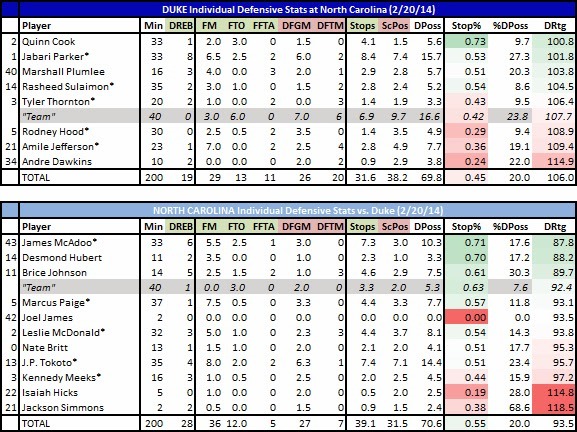 Looking at two of UNC's biggest wins - at Michigan State and vs. Duke - McAdoo was UNC's best defender on the floor. I didn't chart the UAB or Belmont games (or the Miami and Wake Forest contests to open the ACC season) but I would be willing to bet he wasn't near the top. If UNC is going to play like an Elite Eight or Final Four team in the NCAA Tournament it will need performances like McAdoo's against the Spartans and Blue Devils. He was -4.9 vs. his team against MSU and -5.7 vs. Duke. Those are big-time numbers, folks. The player I really like for UNC though is Brice Johnson. He was saddled with early foul trouble but when he played he was the player I enjoyed watching, especially defensively, during the game. You can see that even in his limited minutes he stuffed the stat sheet. His defensive usage percentage topped 30, which says he was either targeted in Duke's game plan or he just got himself involved because of his "want to." I'm always amazed when a player like Marshall Plumlee comes into the game how much his impact is energy-related. Plumlee didn't have a great game but in limited minutes he made enough hustle plays and forced enough misses to be a plus defender. It'll be curious how he develops down the line when playing both minutes, both on the offensive and defensive end. Poor Amile Jefferson. I really like the kid, but he had a miserable game. First off, he had one defensive rebound, which is sad for his size and athleticism in a game of this magnitude. Second, he gets blitzed by fouls because he's either in poor position or just has cement feet (he had three fouls before halftime). This was one of those games where Duke was dominant for much of the game but North Carolina continued to hang around and hang around. We've seen this script many times this year (Michigan at Michigan State and Michigan at Ohio State are two that come to mind) where one team seems in total control but allows the opponent to be close enough to let the game slip away. That's what I feel happened here. UNC changed the game by going to a 2-3 and 1-3-1 zone about five minutes into the second half. From the 15:00 and 6:30 mark in the second half, Duke scored two points on 15 possessions (0.13 PPP) and went 0-for-8 on jumpers in that stretch. Those eight and a half minutes were really the difference. 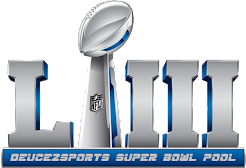 I can't wait for Round 2 in March.